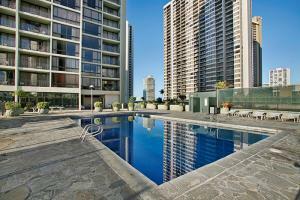 Enjoy spectacular views of Diamond Head, the blue Pacific or the Honolulu city lights. Well-suited to families and centrally located in a quiet residential neighborhood just over one block from famous Waikiki Beach, this resort offers relaxed island-style living in spacious one-and two-bedroom suites with complete kitchens and private lanais. Pool, sauna and sundry store on-site. Approximately 2 blocks from the beach. 1 block Kapiolani Park and the Honolulu Zoo.